Spicy chicken and red peppers topped with a creamy Thai peanut sauce, crunchy peanuts, and served in crisp butter lettuce cups. Easy, healthy, and ready in 20 minutes! Whisk together sauce ingredients and set aside. Dice chicken into small pieces - less than 1/2 inch. Drizzle pan with oil. Add chicken and saute over medium heat about 5 minutes until browned. Add red peppers and cook another 2-3 minutes until peppers are tender and chicken is fully cooked through. 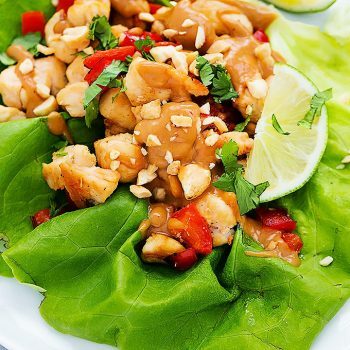 Fill lettuce leaves with chicken and pepper mixture, then top with peanut sauce and chopped peanuts. Serve with fresh lime wedges if desired, for squeezing on top, and chopped cilantro. If you love sauce (like me!) then definitely double the sauce portion of the recipe.